Tougaloo College welcomes Huntington Ingalls Industries CEO and President Mike Petters as the keynote speaker for its 31st Annual Tougaloo College Business Luncheon. Scheduled for Friday, February 22, 2019 at the Hilton Jackson Hotel, the milestone event, during the College’s sesquicentennial, is a meeting of those who understand the need for business-education collaboration to build better futures. In addition to recognizing past speakers and paying homage to the luncheon founders, the invitation- only event brings together more than 300 business and community leaders, policy makers and educators who exchange ideas on economic opportunities and challenges from a state, national and global perspective. The luncheon also will serve as a platform for the college to recognize and express appreciation to companies, organizations and individuals who have supported Tougaloo’s mission and vision. 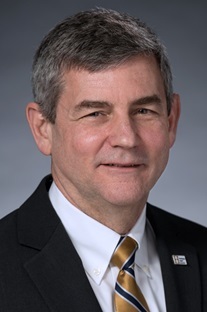 Joining the impressive list of the College’s luncheon speakers, Petters speaks from the perspective of leading America’s largest military shipbuilding company, which provides manufacturing, engineering and management services to the nuclear energy, oil and gas markets. Also serving as a member of the Huntington Ingalls Industries (HII) Board of Directors, Petters’ leadership directly correlates with the theme of this year’s luncheon, “Transforming the Future Through Strategic Partnerships,” as it takes a an adept team to lead a large company, as the same is required to train and prepare students to become global leaders. With tremendous leadership experience, Petters’ speech is highly anticipated to be the springboard for great conversation and the conceptualization of other great business partnerships. As corporate partnerships show Tougaloo students they have the support and foundation from which to uplift and sustain their education, the College provides a great resource of talented potential employees to businesses. “Tougaloo College has a tradition of graduating students who go on to make significant societal contributions in various professions. It is imperative that we develop strategic partnerships with partners that will help us in that process. Tougaloo College has been that partner for Ingalls Shipbuilding through our internship program,” says Edmond Hughes, who is vice president of human resources and administration at HII’s Ingalls Shipbuilding division, as well as a College trustee. Exposure to the inner workings of large corporations like Huntington Ingalls Industries is imperative for Tougaloo College students, as it prepares them for future opportunities. “As a Huntington Ingalls Shipbuilding College Intern, with the opportunity to serve as a Huntington Ingalls Ambassador, I know and appreciate the value of receiving handson career-related experience from business professionals. Tougaloo College is providing me with so many priceless opportunities, in and outside of the classroom, to grow personally, academically and professionally. I am truly thankful for Tougaloo’s business partners, who recognize the value in investing in young people, like me. There are so many ways I want to positively impact the world, so I’m grateful for my scholarship and internship opportunities, as well as other leadership experiences that are preparing me to become an asset to our society,” says Nyaia A. Liddell, a junior Biology Major. While partnerships assist Tougaloo College in molding leaders, meetings among current business leaders, such as those who will attend this year’s business luncheon is essential in creating an environment for the collaboration of next generation business ideas and concepts. Having served as president of Northrop Grumman Shipbuilding and as president of Northrop Grumman’s Newport News sector of Newport News Shipbuilding, Petters’ current and previous leadership is a model for Tougaloo College students, as well as the local, state and national business community. The Florida native earned a bachelor’s degree in physics from the US Naval Academy, earned an MBA from the College of William and Mary and spent five years in the US Naval Reserve. With Petters serving as this year’s business luncheon speaker, the College demonstrates its dedication to partnering with businesses to ensure that students are prepared for post baccalaureate success. As the global economy increasingly requires leaders and workers who are productive, resilient and lifelong learners, Tougaloo College remains committed to producing students who are ready to lead in their professions and serve in their communities.